Minor injuries in M 20 crash. Shelby-Benona firefighters clean up the scene following the crash. 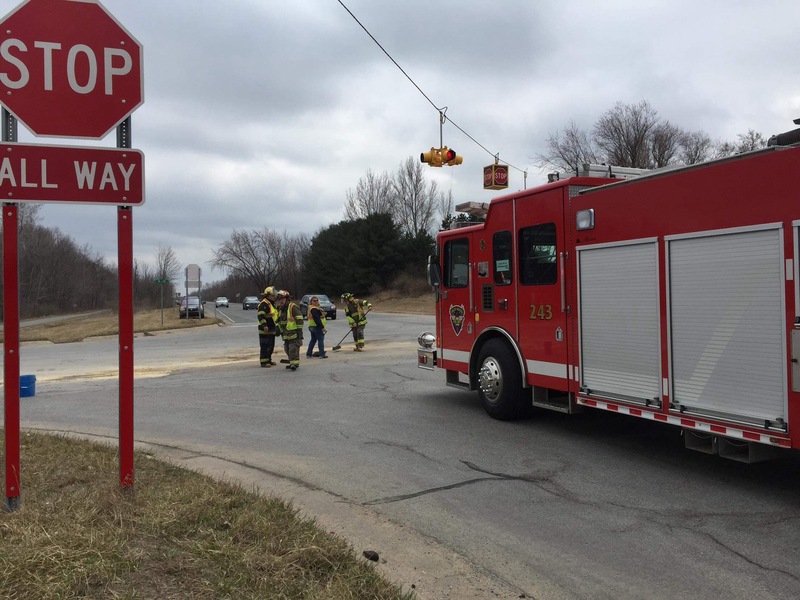 SHELBY TOWNSHIP – The drivers involved in a two-vehicle crash Saturday, April 6, shortly before 1:30 p.m. at the intersection of M 20 and Oceana Drive north of New Era received minor injuries, according to an Oceana County Sheriff’s Office accident report. A 2007 Chrysler Town and Country minivan driven by a 39-year-old Ludington woman was eastbound on M 20 when it ran the stop sign and struck a 1996 Chevrolet Suburban driven by a 32-year-old Hart woman, the report states. The suburban was northbound on Oceana Drive. The minivan had a 10-year-old Ludington girl as a passenger, and the Suburban was transporting two Hart boys, ages 8 and 9. None of the children were injured, and everyone involved was wearing a seat belt. Life EMS treated the accident victims at the scene. The minivan driver was cited for failure to yield right-of-way, the report states.